The coherent monochromatic CO2 laser beam can be precisely focused through an optical lens system (of appropriate material) so that high cross- sectional energy density can be achieved at the focal point in a spot of less than 1 mm. The high-energy laser beam passes through air and is absorbed as it hits liquid or solid objects, so that it can be used for precise surgical work for tissue incisions, vaporization, and coagulation. The reflectivity of the laser decreases as the wavelength increases for all substances other than surface-polished metals at wavelength of 10.6 µxm. Because of its 80–90% water content, body tissue acts as a black body and will rapidly absorb this energy. 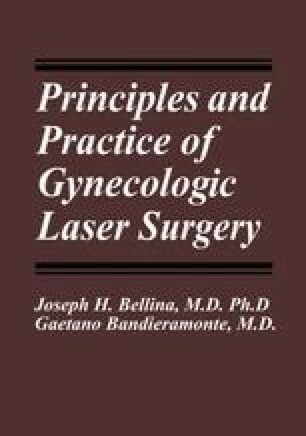 For this reason, CO2 lasers can be used in surgery. The energy of a continuously emitted CO2 focused laser beam creates an incision by tissue vaporization. The defocused beam has a lower energy density and produces rapid thermal increase, with gradual fluid vaporization, dehydration, and carbonization causing the cells to shrink and having a coagulative effect.1,2 The shape of the crater of the vaporized tissue and of the adjacent necrotic zone is in direct relation to the transverse electromagnetic mode (TEM) of the laser beam.